The saga between the Detroit Red Wings and young forward Andreas Athanasiou is, at long last, drawing to an end. And the result is in the Red Wings’ favor. On Thursday the team announced that they had agreed in principle to a one-year contract with the 23-year old restricted free agent after months of contractual stalemate between the two sides. The deal will see Athanasiou make $1.3875 million, about $1.2 million less than his initial asking price. The deal comes just after Athanasiou found his way to Switzerland to continue his workouts while waiting to see which option would best suit him. Offers from the Russian Kontinental Hockey League topped out in the range of $3.8 million. The Red Wings previously made an offer of 2 years at $1.9 million annually, which Athanasiou refused. Athanasiou, per general manager Ken Holland, must clear a couple of hurdles before he can rejoin the team; namely the immigration process in returning to the United States and passing a physical. It will be a little longer before he sees the ice with the Red Wings this season, but his missing about 10 games is much more welcomed than not having him at all. The one drawback this deal presents is the possibility for this exact same scenario during the 2018 off-season. Athanasiou will once again be a restricted free agent, along with Anthony Mantha and Dylan Larkin. As well, Athanasiou will qualify for arbitration rights, which can cause more trouble if the two sides are not close on a deal then. But this is a bridge the club will cross when they come to it. Figuring out where he will fit in the on-ice rotation will fall to coach Jeff Blashill, who will undoubtedly be eager to get Athanasiou’s speed and scoring ability back into the mix. He was the #2 goal scorer on the team last season, finding the back of the net 18 times, trailing only Tomas Tatar’s 25 goals. Exactly when he will rejoin the team is yet to be seen. But the Red Wings will, for the time being, relish in the fact that their young offensive core is once again fully intact. On the business end the issue of creating cap space for Athanasiou’s new deal was dealt with in the form of two trades. The first trade sent centerman Riley Sheahan to the Pittsburgh Penguins, clearing his $2.075 million from the Red Wings’ books, creating more than enough room for the money Athanasiou is promised. They also sent a 2018 fifth round draft pick to Pittsburgh. 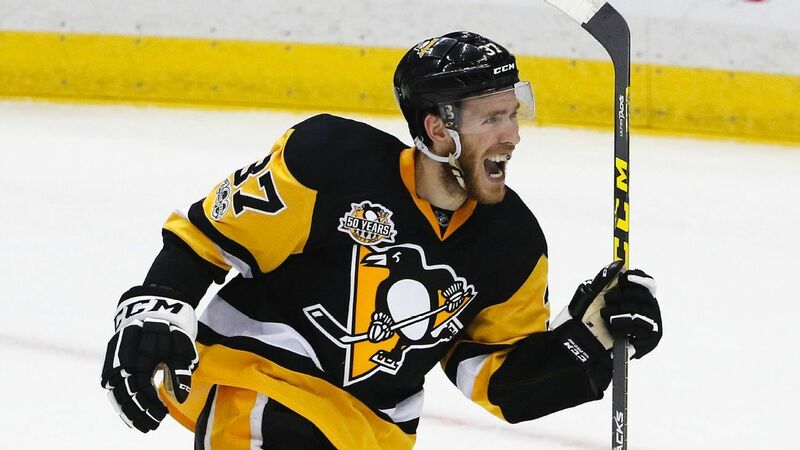 In return the Red Wings received forward Scott Wilson (28 points in 76 games in 2016-17, $625,000 cap hit) and a 2018 third round draft pick. To clear additional space the Red Wings sent defensive prospect Ryan Sproul to the New York Rangers for Windsor, Ontario, native Matt Puempel (six goals in 27 games for the Rangers in 2016-17). Sproul, coming back from an ACL injury suffered last season, is a victim of the overflow of defensive prospects in the Red Wings minor league system. Both Wilson and Puempel are still young (25 and 24, respectively), though Wilson is the new piece that’s more likely to make a more immediate impact, averaging 10:27 average time on ice in three games for the Penguins this season. He’s still looking for his everyday role and it’s not out of the question that he takes Sheahan’s spot on the fourth line. His place is dependent on where Athanasiou is thrown into the rotation, as well as what the club decides to do with veteran David Booth. Puempel is a work in progress as well. He has promise on offense, according to EliteProspects.com, with a good shot, good playmaking ability, solid acceleration, and dependable hands. He will likely report to the Grand Rapids Griffins of the AHL upon arrival, adding to the Red Wings’ crop of young forwards. Find me on Twitter @milz_chris and follow @CleatGeeks for more hockey and sports news.